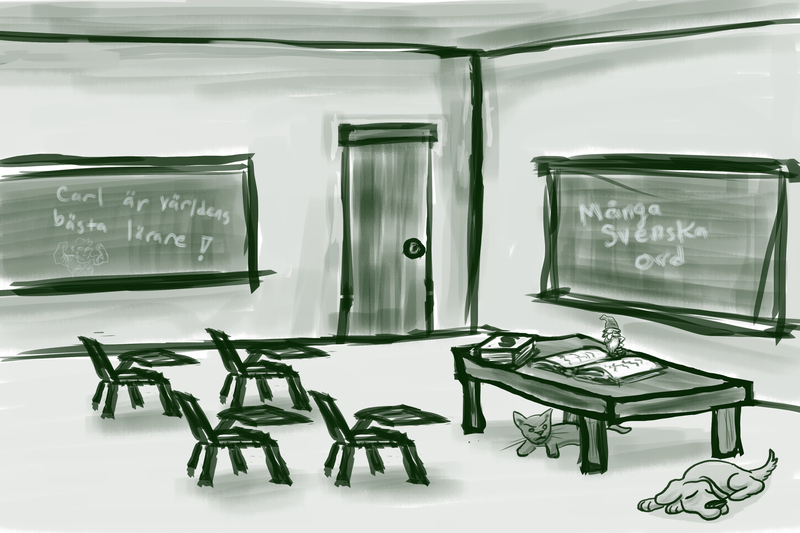 Teaching | Vikings, Books, etc. After fiddling around not knowing what I would draw, it turned into a sort of sunset/late-night summer sun sort of a pic–not sure if it fits the bill of “capturing the spirit of Norse Mythology” for the art contest I posted about earlier, but if I don’t manage to pull anything else together in time, I may just submit this. Or I may just let it be. I enjoy it well enough just on it’s own (though if I had more time, there is a lot I would like to clean up and polish in this picture… but that goes for all my pics). As always, click on the pics to go to the DeviantArt page for them, where you can see larger versions and also buy downloads (for REALLY cheap) or prints! Prints and cards also available on Redbubble, which is easier to buy from. I’m currently an unemployed mythologist (again! ), so feel free to help me out here! 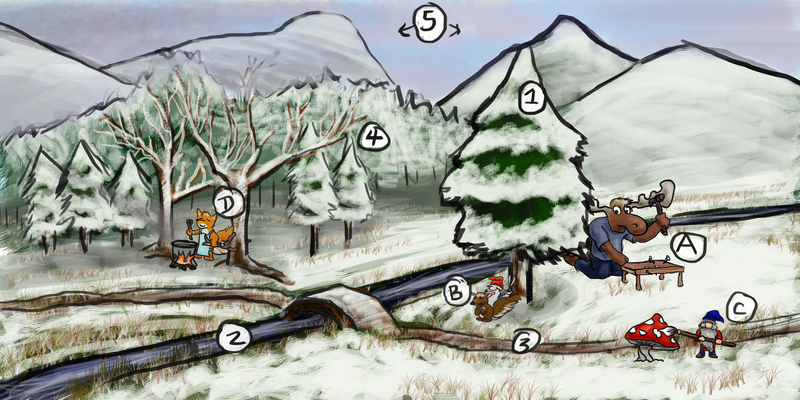 From the final for my first semester beginning Swedish course, testing their classroom vocab as well as spatial prepositions. I had really wanted to turn this into something more polished, but the end of Fall semester was just too crazy, and I ended up with this sloppy thing. Testing landscape and occupational vocabulary as well as spatial prepositions for my first semester intermediate Swedish course. Alas, I did not have enough time to actually complete a day with Strindberg– in fact, ended up short on sleep as it was. But I really enjoyed this, and will hopefully revisit this theme again. Hope you enjoyed it! Learn to talk like a Viking (Viking = Pirate, and it is talk like a pirate day, so there). 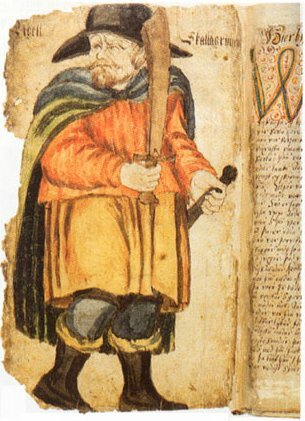 Though the Old Norse grammar that I’ve linked to would be for the literary language of 13th and 14th century Iceland and Norway– if you want some language from the Viking Age and earlier, there is a brief intro to “Ancient Nordic” in The Ancient Languages of Europe (though this is drawing on a very limited runic corpus), and if you want to learn to hold an actual conversation, you can try Modern Icelandic (which is fairly close to the Old Norse/Icelandic of the introduction I linked to at the very start), or you can take Swedish from someone like me, or Norwegian or Danish. A good number of institutions offer one or more of these– UC Berkeley covers all three, and Gustavus has a lively Swedish program, to name just those places I have had the opportunity to teach at. No time for an original Viking picture right now, but here is the one I started this blog with. Vikings! RAWR! 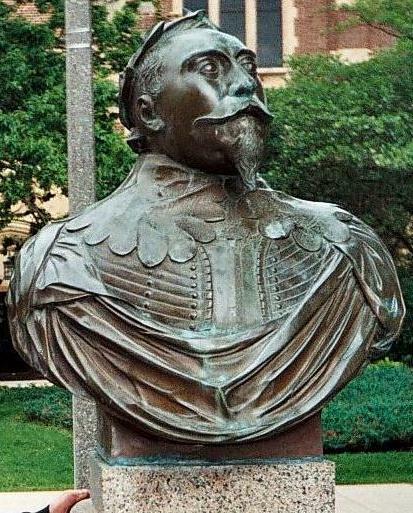 The bust of “Gustav the Great,” defender of protestantism, on the campus of Gustavus Adolphus college. The college has been around for 150 years, and is named after the conquering hero of the Reformation in the north, King Gustavus Adolphus of Sweden, the “Lion of the North.” Not a surprising mascot, as he is so closely identified with Sweden’s “stormaktstiden,” the height of Sweden’s military power (sorry, they weren’t always neutral)– just the person a population of recent immigrants would want for their Swedish-language, Lutheran college in southern Minnesota. I’ve been working a bit recently on Heritage Studies with reference to the reception of Norse Literature and to the construction of Scandinavian American identity, so I’m looking forward to thinking more about the ways in which this bastion of Scandinavian American identity “does” Heritage. The job is only a year at the moment, but there is the possibility of it going tenure-track, so here’s hoping I will be able to teach a course the following year on this topic! Ties in very well with my work in Cultural Memory–though I’m been focusing on Medieval memory for the most part. In any case, here’s to an exciting new chapter! I’m afraid that means I’ll still be short on time for my blog, art, and poetry/fiction (my children’s book that I was planning will have to go on hold indefinitely), but hey, it’s good to be employed!